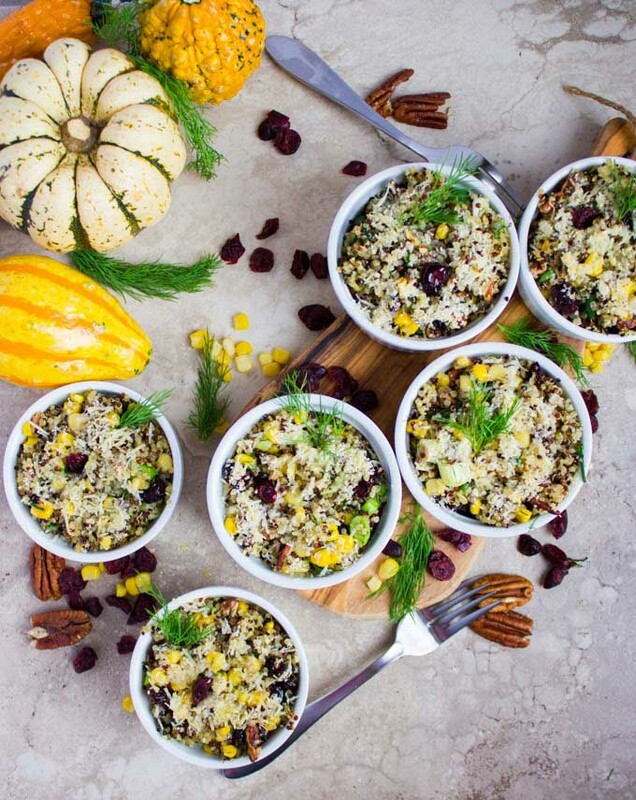 Try my Quinoa Stuffing loaded with Corn, Cranberries, Pecans, and Dill as a healthy, high-protein alternative to traditional Thanksgiving stuffing! 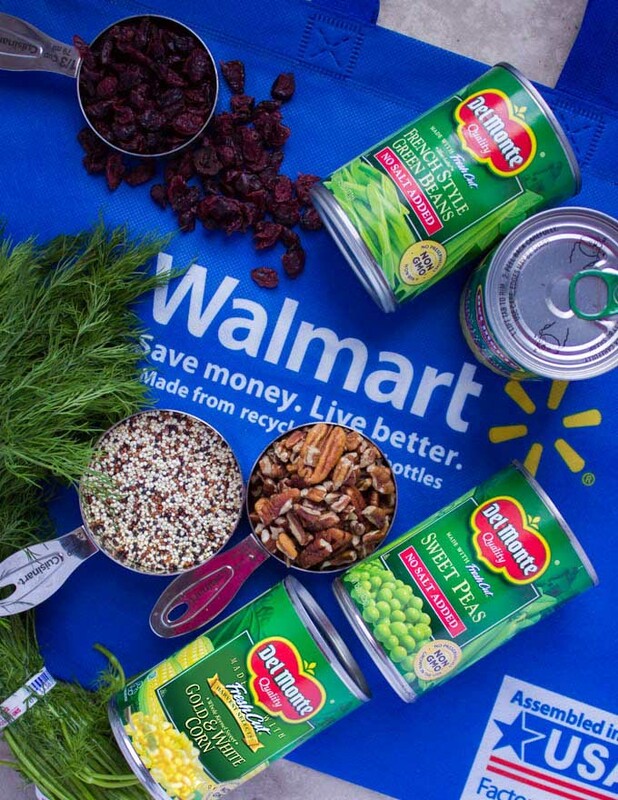 It’s easy to make and can be prepared in advance to save time on Thanksgiving day! Happy November! 🙂 It’s the time of year where all we can think about is Thanksgiving food! Let’s start off with an easy, foolproof Quinoa Stuffing recipe loaded with Corn, Cranberries, Pecans and Dill for a pack of flavor, comfort and crunch! I’m making it for the second year in a row at a Friendsgiving potluck, and I promise you’ll LOVE it! Have you guys started the Friendsgiving tradition yet? I had my first Friendsgiving three years ago and I’ve been HOOKED on it! It’s a totally different energy than our beloved Thanksgiving. Think of it as a more laid-back setting with the same comfort food you love and certainly with a touch more ease and convenience 🙂 I’ve enjoyed Friendsgiving potlucks the most, and I love to be with a group of close friends..sans kids. Combine all that together and that’s a win-win for me! So while it seems like everything is about turkey on Thanksgiving, I personally love the sides, salads, appetizers and breads accompanying the turkey much more! At the end of the day, you’ll have a nice slice of turkey and call it a night. 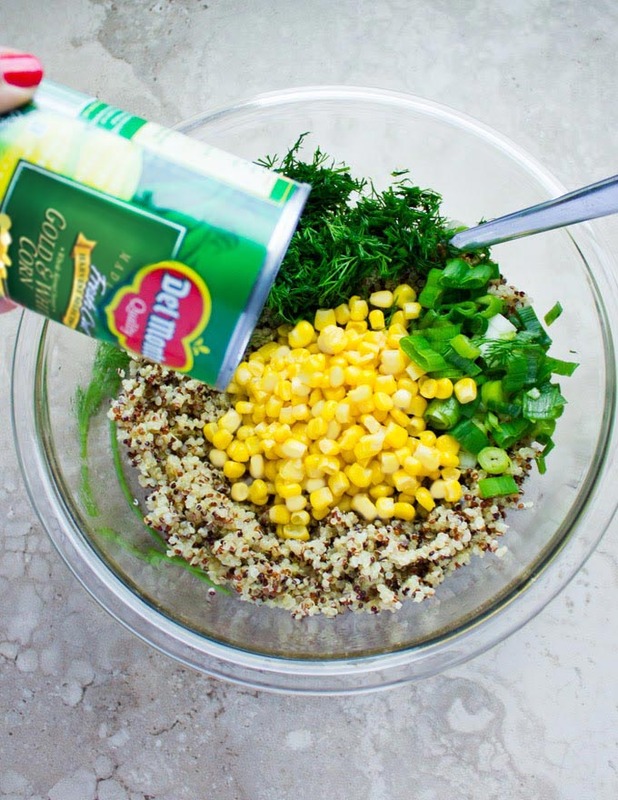 But you’ll be serving many spoonfuls of salad and stuffing like this healthy quinoa stuffing! Let me tell you how amazing this quinoa stuffing is. First of all, the flavor reminds me of the good old stuffing I had as a kid. So while that stuffing didn’t include quinoa for sure, it had a deep flavor of stock, sweetness from cranberries and crunch from the bread. 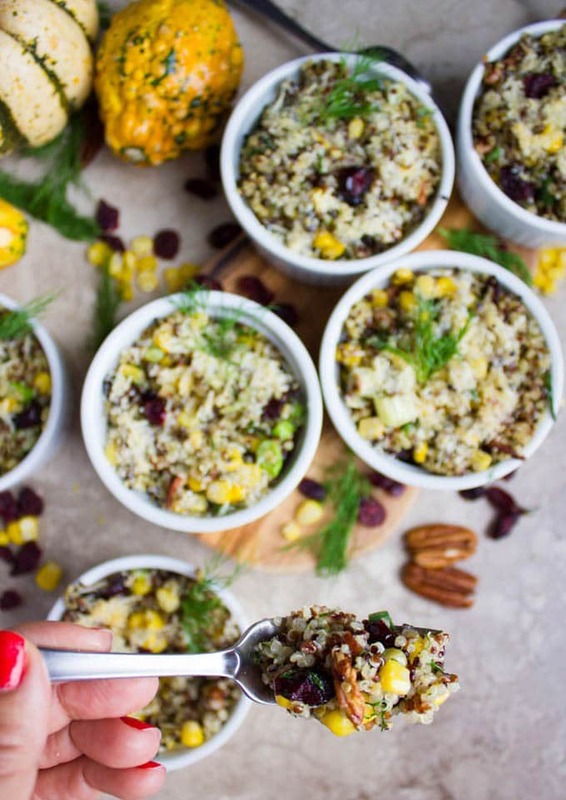 There’s really nothing like an individual ramekin filled with comforting quinoa stuffing! It really puts the cozy into our Friendsgiving or Thanksgiving night! This cranberry-studded quinoa stuffing is wonderfully filling, hearty and tastes like pure comfort. 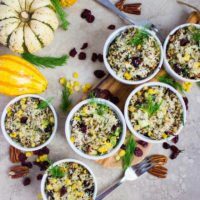 Loaded with sweet corn, cranberries, crunchy pecans and brightened up with a touch of dill, it’s also probably one of the best potluck dishes because you can easily prepare the quinoa stuffing three days in advance and bake them with the stock the day of. Another sweet thing about this Quinoa Stuffing is the individual portion size. I have a thing for mini servings/individual portions like that and I admit it. However, for the record, I find almost everyone loves them too! They’re personalized and feel more special, so they’re ideal for a Friendsgiving! Another bonus is they cook much faster than a large dish! Start off by pre-cooking the quinoa (here’s a post about how to cook quinoa). In the meantime, chop your dill, green onions and warm up your stock. 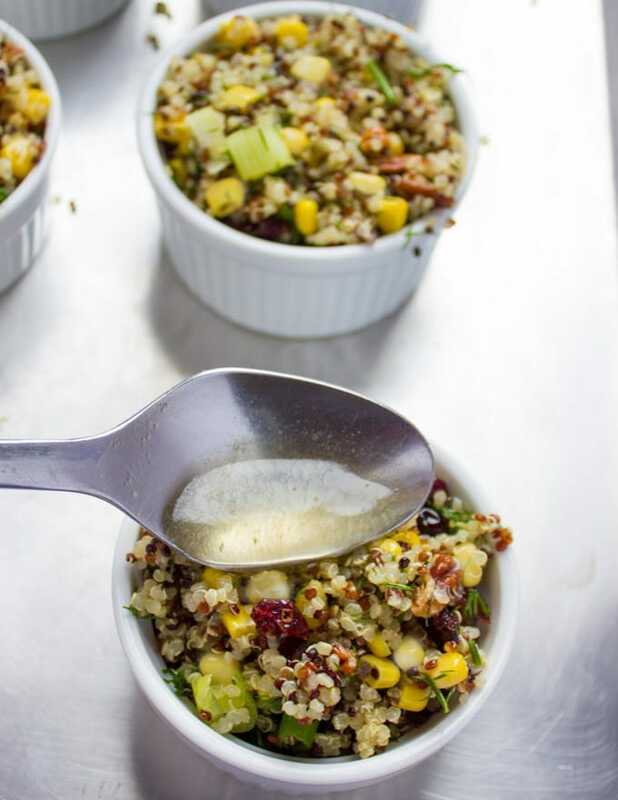 Then, simply toss together the quinoa, sweet Whole Kernel Sweet Gold & White Corn, dill, scallions, cranberries, pecans, olive oil, and salt, then spoon that into eight individual ramekins. Pour two tablespoons of warm stock over each ramekin, a sprinkle of shredded Parmesan cheese (optional—but really GOOD!) and bake for just fifteen minutes to warm up the quinoa stuffing. Finally, I don’t appreciate vinegar in my quinoa stuffing, but by all means, add in a tablespoon of apple cider, balsamic, lemon juice etc. Happy Friendsgiving and Thanksgiving! Try my healthy vegan quinoa stuffing for this year’s Thanksgiving feast and enjoy some quality time with your family and friends. If you ever have leftover quinoa stuffing, then simply toss it in a balsamic vinaigrette or lemon vinaigrette and turn it into a healthy lunch salad! Prepare the quinoa stuffing three days in advance and bake them with the stock the day of. 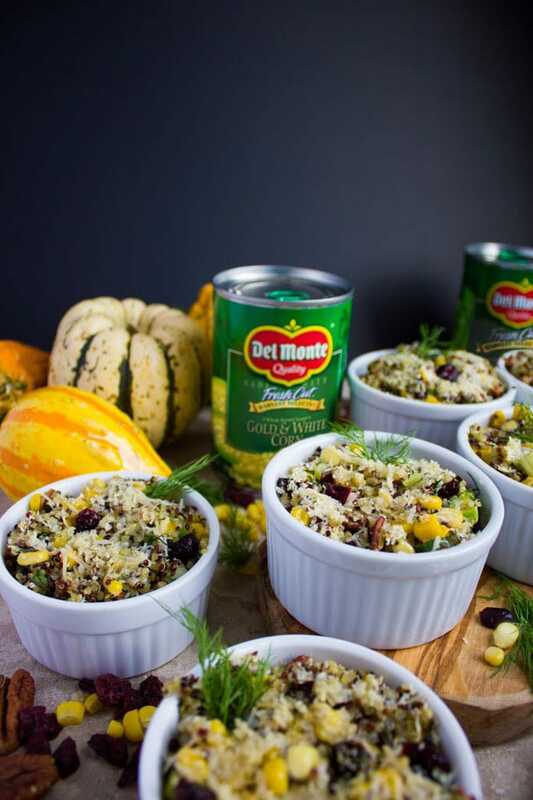 More wonderful additions to this Quinoa Stuffing are roasted squash, any other Del Monte® canned veggies like peas, or green beans. When it comes to corn, I chose the Del Monte® Whole Kernel Sweet Gold & White Corn, but the sky’s your limit—there’s fire roasted corn, cream corn, 50% salted reduced sodium corn..etc.. Seriously good stuff! 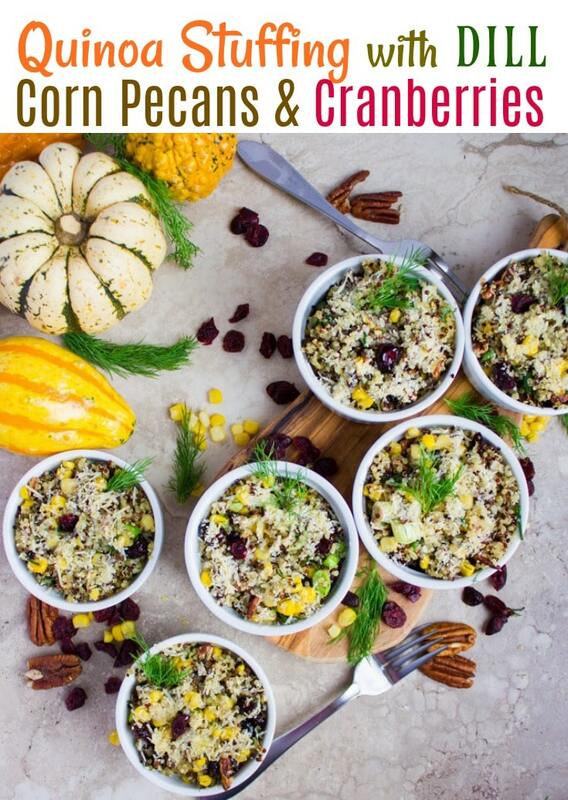 Try my Quinoa Stuffing loaded with Corn, Cranberries, Pecans, Parmesan Cheese and Dill as a healthy high-protein alternative to traditional Thanksgiving stuffing! Bring the 2 1/2 cup of stock to a boil and add in the quinoa. Lower the heat and cover the pot. Let the quinoa cook for 10-12 minutes until the stock has been absorbed. 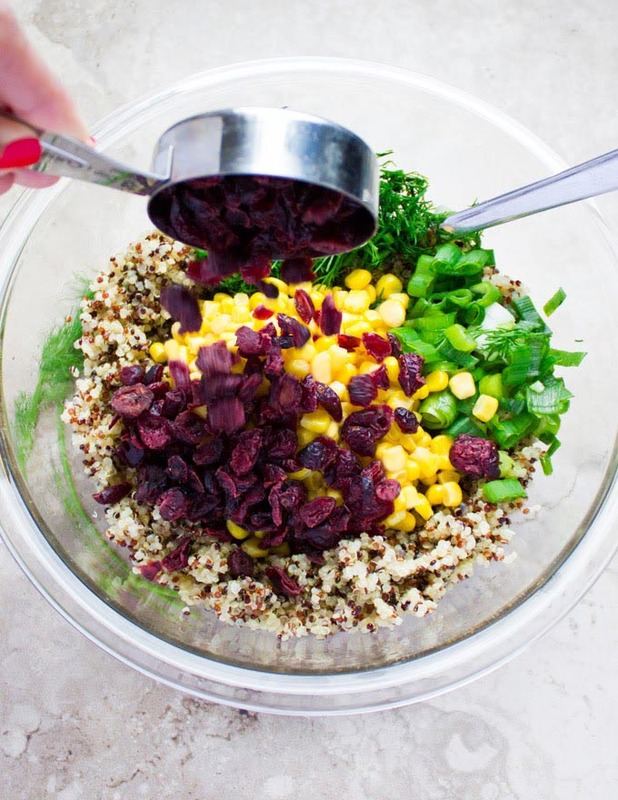 In a large bowl, toss the cooked quinoa, Del Monte® Whole Kernel Sweet Gold & White Corn, cranberries, pecans, scallions, dill, salt and olive oil. Divide the mixture among eight ramekins, six ounces each and place them on a baking sheet. Drizzle two tablespoons of stock over each ramekin and sprinkle a tablespoon of Parmesan cheese. Bake the quinoa stuffing for 10-15 mins until it’s warm and flavors blend it. Serve the stuffing and enjoy!! This looks amazing and like the perfect addition to any holiday table! I have all the ingredients to make this tonight. I just love this idea!! This will be a great addition for my Thanksgiving meal! Looks gorgeous! Love all the flavors going on, adding to my list of must makes! Hope you make it this Thanksgiving! Such a gorgeous and flavorful dish!! The perfect addition to the holiday table!! It looks really flavorful! Would love to give it a try! Love all of these flavors!! Looks healthy and delicious! It really is light as air! Healthy stuffing? Now you’ve gone too far lol. But love the idea!